As an e-commerce retailer your products are the backbone of your business. There’s no denying the importance of great product photography, whether you’re looking to improve sales on your e-commerce product pages or heighten engagement and conversion through social media. As many as 67% of consumers consider image quality to be ‘very important’ when buying online, so investing in clear, high resolution photography is vital for brands and businesses looking to make their mark in a saturated marketplace. This article looks at how your product photography can set you apart from your competitors and deliver you those all-important sales leads. Making your brand more visible is the first step to generating awareness and sales. Visual content typically does very well online, while consumers are 40x more likely to share content that features an image across their social channels. The more shares your product pages receive, the more likely you are to reach new customers, increase traffic and support SEO through social signals. This means that your photography should not only be professional but should also be highly distinctive and branded. Creating shareable content starts with researching your target audience, establishing exactly what content your existing customer base is already sharing and where. Mastering the art of product photography on Instagram is going to differ from taking photographs for Twitter and Facebook, for example. Posts on sites like Twitter are also restricted by character limit, which places more emphasis on stand-out imagery over lots of written content. In an attempt to cut through the noise, marketers are constantly employing visual tricks to attract user attention. Cinemagraphs are an excellent example of this as they allow you to add looping video elements to your photography (like an animated gif). Cinemagraphs are an original and artistic way to bring your brand to life – not only do they set your brand apart but they also delight and inspire audiences. The use of cinemagraphs has increased since social channels such as Facebook and Instagram introduced their auto-play video capabilities. They provide a more native, integrated and visually appealing way to reach new customers, with research suggesting that cinemagraphic content tends to have more virality, with 71% higher organic reach than still photographs. Building a strong brand identity is only ever achieved by illustrating the core values of your business, from your logo and tagline right down to your preferred tone of voice. Product photography is one way to strengthen your brand identity and tie together its image across your web presence. Keeping your photography consistent in style ensures that your brand develops its own digital persona. 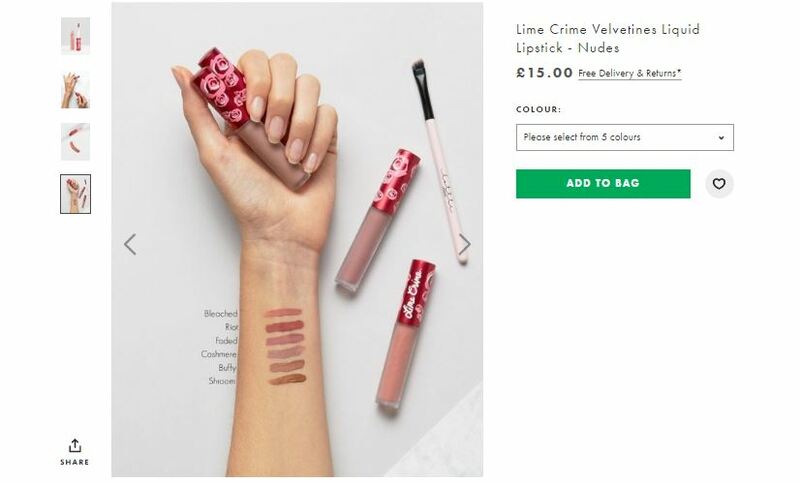 One brand that uses product photography to strengthen their brand identity is online retailer ASOS, who recently started including swatches of cosmetics within their product photography. It’s a step away from the style of product photography commonly used within the beauty industry and in turn has become instantly recognisable among consumers. Far from being able to touch and engage with products as they would in store, customers shopping online only have the imagery you provide to get an idea of exactly what you have for sale. This emphasises the importance of high resolution photography that clearly demonstrates what the consumer can expect to receive when they make a purchase. Visual elements are particularly important to brands that exist solely online, as product photography has the potential to make your brand feel more in touch with the real world. 65% of senior marketing executives agree that visual assets are core to a brand story, something that is key to making your business appear more personable and trustworthy. Getting your product photography right can be beneficial to your business in many ways, yet its primary purpose is likely to be centred on converting customers and increasing sales. One of the challenges of shopping online is that consumers can’t pick up the product, so they have to rely on visuals. As they won’t be able to fully experience the product, your images need to do everything they possibly can to capture the physical benefits and convince buyers that your products are high quality and authentic. DueMaternity.com, an online maternity retailer, found that by investing in rotating 360° product images they were able to increase their conversion rate by 27%. 360° photography adds a new dimension to online shopping as it allows browsers to take a ‘virtual tour’ of your product, simulating an in-store buying experience. It’s no big secret that more audiences than ever before access the internet through mobile devices, so appealing to potential customers that are on the move is crucial. Mobile audiences want quick and easily digestible information and don’t have time to read great swathes of content, so you need to let your product shots do the talking. They say a picture paints a thousand words, and nowhere is this truer than on Instagram. The online photo-sharing platform has recently launched shopping tags, enabling brands to seamlessly add a shop-able element to existing ads. This feature is particularly relevant for mobile users who enjoy the convenience of making purchases on the go in one click. Whatever the size and scope of your business, high quality product photography is essential for those hoping to generate revenue through e-commerce. Product photography is often more cost effective than one might think, especially given its necessity. To learn how Ad-Rank can help you get the most out of your product photography, contact us today.